Global Weather Oscillations (GWO) says the 2016 and 2017 Atlantic hurricane seasons will be the strongest in over 4 years, and have the most United States hurricane landfalls since 11 were experienced during the destructive seasons of 2004 and 2005. GWO has issued the most accurate predictions of any organization over the past 7 years, and says - unlike the past three hurricane seasons that were dominated by hostile atmospheric conditions that subdued hurricane activity since 2013, and during the 2015 El Niño season - The next few years will be in a “Climate Pulse Hurricane Enhancement Cycle” that will provide very favorable conditions for development of tropical storms and hurricanes. The Atlantic Basin Hurricane Season runs from June 1 to December 1, and on the average has 12 named storms, 6 hurricanes and 2 or 3 major hurricanes. The 2015 hurricane season officially ended with 11 named storms, 4 hurricanes and 2 major hurricanes. However, it should be noted that Hurricane Alex formed on January 14th of this year, only 6 weeks following the official ending of the 2015 season – but nearly 5 months prior to the beginning of the 2016 hurricane season. Regardless of the timing, Alex was officially called the first hurricane of the 2016 Hurricane Season based on the January to December Gregorian January - not the natural climate and weather calendar that drives development of tropical storms during a season. But with Hurricane Alex being more closely attached to the 2015 into early 2016 El Niño and the climate season – this means the 2015 hurricane season actually had 1 additional named storm and hurricane. This brings the total for the 2015 season up to 12 named storms and 5 hurricanes, which is very close to the long term average of 12 named storms and 6 hurricanes. The numbers for the 2015 season are very important when it comes to predicting the upcoming hurricane seasons, and this is why – the occurrence of an El Niño during a hurricane season typically suppresses the number of named storms significantly – but it did not, and this is a signal for what is in-store the next few seasons. CEO David Dilley of GWO says the combination of the El Niño ending before the 2016 hurricane season, and the high number of named storms (12) connected to the 2015 season - signals that a “Climate Pulse Hurricane Enhancement Cycle” is now in place, and this will provide very favorable atmospheric conditions for hurricane development and landfalls during the next couple of years. Mr. Dilley predicts the upcoming 2016 and 2017 seasons will be much stronger than the past three seasons, and it will likely be the most dangerous and costly period in over 10 years. The 2016 season will have 17 named storms, 9 hurricanes, and 4 major hurricanes. Three of the GWO United States prediction zones are at high risk for hurricane conditions in 2016. One of the zones has a high risk for a major impact hurricane. The 2017 season will be more dangerous and costly than 2016, with 17 named storms, 9 hurricanes, 5 major hurricanes, and several of the GWO prediction zones will be at high risk for major impact hurricanes. Over the two year period, GWO expects 5 to 8 United States Hurricane Hot Spots. GWO is the only organization that issues detailed preseason predictions two years into the future for 11 United States prediction zones from New England to Texas. GWO’s predictions have been the most accurate of any organization the past 7 years, and GWO is the only organization that predicted the occurrence of Hurricane Ike (2008), Irene (2011), and Sandy (2012). Hurricanes Irene and Sandy were predicted 2 to 3 years in advance. What makes GWO standout from other organizations is their commitment to research and development of GWO’s “Climate Pulse Technology” (CPT). The CPT prediction model incorporates natural mechanisms that control the rhythm of weather and climate cycles, which in-turn control future hurricane paths. Research over the past 30 years has found that each of the Atlantic and Gulf coastal zones have different weather cycles, and within each cycle, there exists smaller weather cycles which make each zone unique. Once all of the cycles are discovered, GWO then uses the Climate Pulse Technology to accurately assess the intensity of a future hurricane seasons, and the probability risk for hurricane or tropical storm conditions within a prediction zone for that year. GWO Webinars, detailed hurricane zone predictions, prediction performance over the past 7 years, graphics, and the “free” climate change e-book “Earth’s Natural Climate Pulse” (authored by David Dilley) can be acquired through the Global Weather Oscillatlions web site. In addition, an interactive electronic subscription to the GWO’s hurricane predictions can also be acquired through GWO’s working partner XtremeGIS the risk management division of the Wall Street Network. When GWO predicts a high probability for hurricane conditions within one of their prediction zones, it is red-flagged as a hurricane or tropical storm “Hot Spot”. GWO’s hot spot predictions for the United States have been nearly 87 percent accurate since 2006, and instrumental for long-range planning by companies and other organizations. GWO is the only organization that predicts hurricane conditions for specific zones, and for up to 4 years in advance. 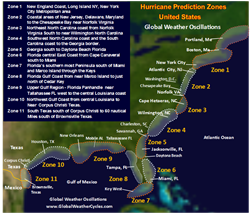 Detailed predictions for the 11 hurricane zones can be obtained by going to the Global Weather Oscillations web site.